A tribute to Emory's 19th president, James Wagner, "The Wise Heart" was first shown at a farewell gala on June 3. Featuring interviews ranging from students to former President Jimmy Carter, the video heralds Wagner's achievements. 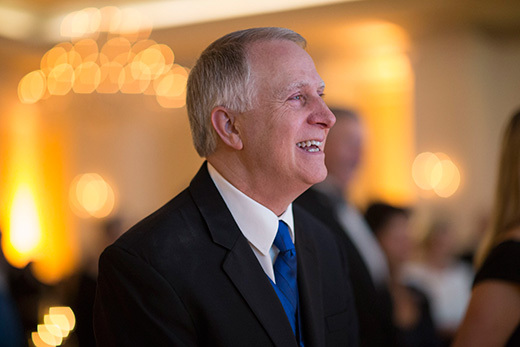 As Emory President James Wagner prepares to retire in August, the University is honoring his legacy in ways that will be visible to students, faculty and alumni for decades to come. Ethical engagement has been a pillar of Wagner's tenure at Emory, highlighted in the University Vision and strategic plan enacted through his leadership. That commitment will be recognized by the creation of the James W. Wagner Chair in Ethics. "The true purpose of higher education is to lead us out of our self-centered universe to a place where we can perceive the world from others' perspectives and have a positive effect on the community," Wagner noted in his inaugural address in April 2004. "Higher education is as much about gaining insight as it is about gaining information; as much about seeking wisdom as it is about seeking knowledge." The James W. Wagner Chair in Ethics has been established through generous gifts and pledges totaling over $2 million from members of the Board of Trustees, the president’s cabinet, and friends of Emory. When fully funded, the Chair will be used to attract or retain a stellar ethicist with a faculty appointment in any of Emory's academic units. Anyone wishing to donate to the chair may contact Susan Cruse, senior vice president for development and alumni relations. You may also donate online by choosing "other" as your gift designation and indicating "James W. Wagner Chair in Ethics" in the space to specify where your gift should be directed. Emory faculty and staff may donate by payroll deduction; the SK number is 56445 for the James. W. Wagner Chair in Ethics. Wagner's 13 years at Emory's helm also included both extensive campus construction — designed to support the goals of the University's strategic plan — and a renewed focus on the undergraduate living experience. Emory will honor his leadership of both as the green space adjoining several of the University's first-year residence halls is officially named the James W. Wagner Quadrangle. Part of the Campus Master Plan 2005 Update, the freshman village was designed with the goal of consolidating most first-year students near the core of campus, creating a shared freshman experience. The plan included the construction of a series of state-of-the-art residence halls. "Well designed and sited on-campus, residential facilities enable students to optimize their Emory experience by participating in formal and informal activities," the master plan notes. "The coming and going of students and faculty about campus creates a more vibrant academic community." The first of the new residence halls, Turman Hall, opened in 2007. Few and Evans Halls (which will be home to sophomores in the 2016-17 academic year) opened in 2008, followed by Longstreet-Means Hall in 2010, Hamilton Holmes Hall in 2012 and Raoul Hall in 2014. The first-year residence halls feature themed "living-learning communities" intended to extend learning and collaboration beyond the classroom. The James W. Wagner Chair in Ethics and the naming of the first-year quad were announced June 3 during a farewell gala for Wagner held at The St. Regis Atlanta. Titled "The Wise Heart: A Salute to James W. Wagner," the evening included the presentation of a tribute video, also called "The Wise Heart" — a reference to how Wagner has embodied Emory's motto, "Cor Prudentis Possidebit Scientiam," which translates to "The wise heart seeks knowledge." Earlier in the day, the Emory Board of Trustees voted to bestow upon Wagner the title of President Emeritus, effective Sept. 1. This honor was also publicly announced at the gala.